Trevi is developing nalbuphine ER in a range of indications for which patients have few treatment options. With its dual mechanism of action, acting as both an antagonist (blocker) to the mu opioid receptor and as an agonist (activator) to the kappa opioid receptor, nalbuphine ER has the potential to significantly improve the quality of life of patients suffering from serious neurologically mediated conditions by targeting the central and peripheral nervous systems. We are conducting a rigorous global clinical development program for nalbuphine ER. A chronic, intensely pruritic dermatological condition characterized by the presence of pruriginous lesions such as papules, nodules or plaques, which may be associated with excoriations and ulcerations. In September 2018, we initiated our pivotal Phase 2b/3 PRISM (Pruritus Relief thru Itch-Scratch Modulation) clinical trial evaluating the safety and efficacy of nalbuphine ER in patients with severe pruritus associated with PN. The PRISM trial is a randomized, double-blind, placebo-controlled, parallel, two-arm, 14-week treatment study that is evaluating the safety and anti-pruritic efficacy of nalbuphine ER 162 mg tablets in 240 patients at approximately 50 sites in the United States and Europe. We are now enrolling patients in the U.S. (NCT number: NCT03497975) and in the EU. A common complication of chronic cholestatic liver diseases such as primary biliary cholangitis (PBC) and primary sclerosing cholangitis (PSC); patients develop severe whole-body itch, an intense, intractable, debilitating condition that significantly disrupts patients’ daily activities and sleep, and consequently impairs their quality of life. A Phase 1b open label study is underway to determine the safety and pharmacokinetics of nalbuphine ER in patients with moderate to severe chronic liver disease. A common, disruptive pruritic condition principally experienced by an estimated 70% of patients undergoing hemodialysis; causes significant impairment in patients’ quality of life and increased mortality. We are not actively developing nalbuphine ER for uremic pruritus at this time based on our evaluation of the market dynamics, but may consider resuming development in the future. IPF is a rare, chronic, progressive lung disease, characterized by scarring and thickening of lung tissue; most patients diagnosed with IPF suffer from a dry, non-productive chronic cough that interrupts their daily living and significantly contributes to poor quality of life. Subject to the submission of an Investigational New Drug Application (IND) for this indication, we intend to initiate a Phase 2 trial of nalbuphine ER in the first half of 2019 to evaluate the safety and make an initial assessment on its efficacy on cough in patients with IPF. Involuntary movements that negatively impact patients’ lives; it is estimated that motor complications resulting from levodopa therapy affect about 400,000 patients with Parkinson’s disease in the United States, with dyskinesia occurring in approximately 150,000 patients. 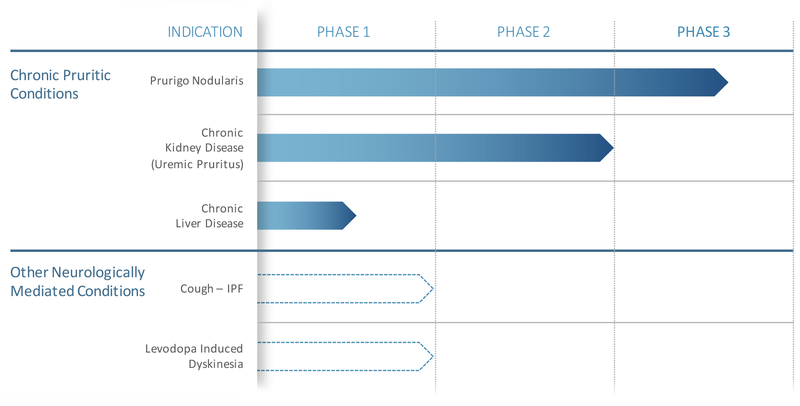 Subject to discussions with the FDA and the submission of an IND for this indication, we intend to initiate a Phase 2 trial of nalbuphine ER in the second half of 2019 to evaluate the effect of nalbuphine ER on LID in patients with Parkinson’s disease. as presented at the National Kidney Foundation Spring 2016 Meeting. as presented at the 2014 Meeting of the Society for Investigative Dermatology. as presented at the 2014 Meeting of the American College of Pharmacology. as presented at American Society of Nephrology’s 2014 Kidney Week. as presented at 7th World Congress on Itch (2013).